Calpis (カルピス Karupisu) is a Japanese uncarbonated soft drink, manufactured by Calpis Co., Ltd. (カルピス株式会社 Karupisu Kabushiki-gaisha), headquartered in Shibuya, Tokyo. 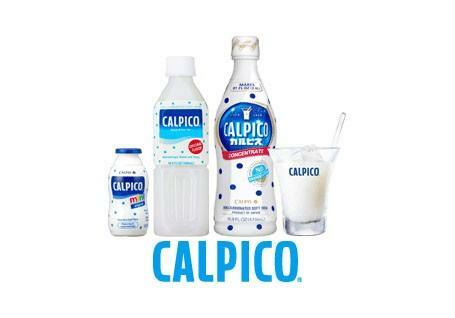 Calpis Co. is a subsidiary of Asahi. The beverage has a light, somewhat milky, and slightly acidic flavor, similar to plain or vanilla flavored yogurt or Yakult. Its ingredients include water, nonfat dry milk and lactic acid, and is produced by lactic acid fermentation. The drink is sold as a concentrate which is mixed with water or sometimes milk just before consumption. A pre diluted version known as Calpis Water (カルピスウォーター Karupisu Wōtā), or its carbonated variety, known as Calpis Soda (カルピスソーダ Karupisu Sōda), are also available. It is also used to flavor kakigori (shaved ice) and as a mixer for cocktails and chuhai.